I am about to start teaching the Moms Ministry at Bellevue Baptist on February 7th. I was wondering if you would be willing to share with me, what's your deal? As a momma, what is your greatest concern or issue? Your input will help me immensely as I prepare to teach my sweet little mommas at Bellevue. So internets, give me some idea of the issues you are dealing with. You do not have to sign your name but tell me the ages of your children. This will be a huge help to me. Blessings. Internets, decisions have been made. A color has been chosen. Paint has been bought. Tune in tomorrow and just see what color my office is going to be. Green walls...you are dead to me! Thank you for praying for me as I spoke at the retreat for Kirby Woods Baptist Church. What a blessing it was to be with this group. The ladies were so teachable that it was just "plain fun" to be in their midst and to share the Word of God with them. I saw many dear former moms and got to catch up with some very special ladies who have crossed my path. Several of my current moms (Emily Rainey, Angie Roberts from Jackson, and Sherry Ewing) were there to cheer me on and that was an extra sweet blessing. Much love to Amy Barron, the Women's Ministry Director at Kirby, for all the hard work she and her committee invested in the retreat. She is a dear and a faithful servant of the Lord. It was a great trip. Craig and I returned home renewed and refreshed in our own spirits for having been in the midst of a great group of ladies! May God richly bless the ministry of Kirby Woods Baptist! Blessings. Beloved Internets, we are pleased to announce that we are to be the proud grandparents of a healthy baby BOY! Dawson and Kathryn had an untra-sound this morning and we are getting us a boy! You know how partial I am to boys. Having raised 2 boys myself, I can tell you I feel so privileged to have grown up 2 boys into strong men. And I am thrilled that Kathryn and Dawson will have the same honor Craig and I had...raising up a man to the glory of God. What fun. He is expected to make his debut at the end of June, making him and Declan a year apart in age. Can you even imagine the fun the 2 cousins will have growing up together!!! And what fun for Craig and I to have 2 sweet princes to enjoy. God is so good. Please join me as we to the dance of joy...the boy dance of joy!! I realized I had not posted a current picture of our Sweet Prince of late. 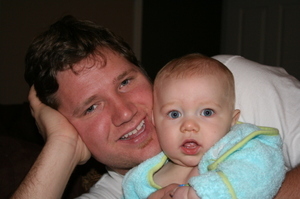 Here he is, fresh out of the bath, with his daddy. Seriously...that's cute. I am off today to speak to the women of Kirby Woods Baptist Church at their retreat at Pickwick. I cannot tell you how excited I am about going. Every contact I have had with them has been a blessing and I am looking forward to sharing the Word of God with them. Please pray for me as I speak 4x to this precious group. The study of Elijah was dropped off at the church this morning and is going to print. We will begin the publishing process for it in February. I will report back on Monday. Check in then. The decision on the paint color is just about to come to an end as I will have time next week to paint my office along with my dear friend, Ray. I will keep you posted! Blessings. This May Be My Problem! It may not be the green paint. It may not be the cat on the computer. It just may be the puppies that are at my house. 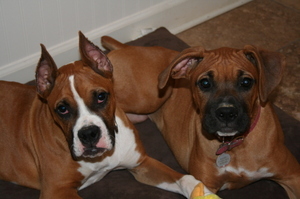 Sadie is on the left and that is Marleigh on the right. Marleigh belongs to Daws and Kathryn but she comes to work with Dawson on the days that Kathryn is working. We run a "doggie day care" on those days! And the two little girls love to be together. Aren't they simply adorable? We think so. This may be why I have had so much trouble getting my words down on paper! I have certainly struggled with writer's block as I have worked on the Bible study called "Fresh Fire" on the life of Elijah. 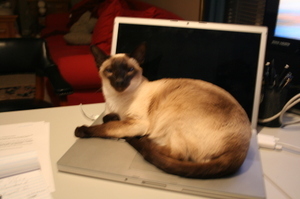 While I said it has something to do with the color of my office, it may have something to do with the cat on the keyboard! This is Joey, my dearly beloved cat friend and constant companion who would like me to leave the room green and stop stressing him out with all the changes. Just so you know, I have finished the study. Ray is in the process of formating it and we will do the artwork tomorrow and turn it in to the church to be copied and spiral bound. It will go to the publisher and we will begin the process of self-publishing our fourth study in February. Yesterday the Internet and I were not on speaking terms so I am sorry I was not able to share with you my paint chip dilemma. Today we have made up so here is what I got. This is the drapes I chose from Pottery Barn. I cannot help myself...I love me some Pottery Barn. And I love these drapes. The green will have to go because there is not a speck of green in my drapes. Also I bought 2 chocolate brown chairs, again from the Barn, for my office and they look oh so good with the drapes. However, these green walls are dead to me. Dead, I tell you. Ray painted the light tan square which is the color of her office to try to help me have a neutral base to test colors. So, give it your best shoot. What color do you think? I am leaning towards a warm light chocolate brown color. I have white Pottery Barn desk and work table in this room. So what color should my office be? I hate to admit that the bane of my existence has been the decision to paint my office. Why did I not leave it the color it had been for the last 15 years and call it done? Oh no. I had to have new wall color because I have a new office and I wanted a new color. Seriously, what was I thinking? This has caused no little amount of grief. I picked out green. Who doesn't like green? I matched it to my cat's bed of all things. Who doesn't like cats? Don't answer that! Anyways, I thought I wanted a shabby chic combination but I can promise you that was not a good plan. I do so wish I had come to that conclusion before I bought the paint and before my sweet friend, Ray, painted it for me. That's right. I did not even paint it myself. Ray painted it for me when I was in Nepal. It took me a long time to tell her that I did not like the color because I felt so badly that she had done all that work. Turns out that she is a friend that sticks closer than a brother or a sister in her case! I had already drawn that conclusion about her but it was nice to have it reinforced. I feel she would gladly help me repaint my office (at least I think she would) if I could settle on a color. Now I have found beautiful drapes that could not possibly go with the green walls that I now have. On Monday I intend on posting a picture of the said walls, new drapes, and enough paint chips to wallpaper my walls and forgo the paint job. I want to hear from you. What do you think I should paint my office? Do any of you have a color on your walls that you just adore? What do you think would provide a soothing place to write and prevent writer's block? Check in on Monday and give me some help. Blessings. Internets, I am still pounding the keys trying to finish the study on Elijah. I have 3 more lessons to write. I have written all day and currently I am suffering from brain drain...a condition I made up that I am never far from frankly! The book is due January 24 in order to get it printed and ready for Moms to start on February 7th. I will start the process to publish this study in February which will be complicated by the fact that I will start writing the next new study in February. I will be teaching, writing and publishing different studies at the same time. Talk about brain drain. And did you know this is a leap year? We get an extra day. Seriously. Where does it come from? I have never understood this phenomenon. Nor can I untangle Daylight Savings Time. And don't even get me started on traveling across the Time Line and losing half a day. I have done this a number of time of late and it confuses me every time. This may be the source of my brain drain! Blessings. Many of you have prayed for our friend, Stephanie Vasofsky. She was diagnosed with stage 4 cancer at age 28. She has a sweet husband, Randy, and a 2 year old, Zoe. After a 9 month valiant battle, she slipped from this world into the glory of the next on Jan. 11. She was at home and slipped away in her sleep. While it remains a divine paradox that one so young would be taken, we rest in the Father's sovereign plan. She did not lose her life; she was finished with it. Her faith never wavered and she fought the good fight, finished her course and kept the faith. She has joined the "so great a cloud of witnesses" in glory that lean over the banister of heaven and urge us to run well our race with our eyes fixed on Jesus. One day we will join you, Stephanie, and we will meet you at the Throne! Girls, if you want a giggle, click on the comment on my post about the paint chips. It is written by "Staff Person" aka Ray-Ray! She is teasing me about my color choice, which was from the fabric of my cat's bed! And she is the one who painted it for me while I was in Nepal. And she is the one who has every right to make fun of me for wanting to change the wall paint color back to what it was to start with! Seriously. I deserve it! Why I thought I was good at picking wall color paint out is beyond me. That is not "my deal." And that fact that I chose green, well, it still is beyond me. Giggles galore! Since launching the ministry we have made many changes in our house. We turned Jason's old bedroom into an office for Ray-Ray. We rearranged Daws' room and made an office space for Craig, who "works for me" part time. Loves me full time, works for me part time! We totally re-organized my office/scrapbook attic space. When it is finished I will post pictures. 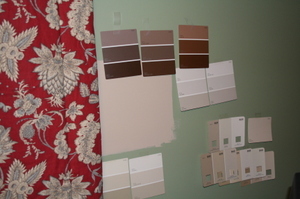 Currently I am stuck on wall paint colors. I picked out a shabby chic green that I just loved until it was on the walls. Now I loathe it. Seriously. Loathe it. It is altogether wrong. Now for a girl who used to write in the midst of total chaos, it is really strange, but this green wall color is creating writer's block. At least that is what I am blaming it on. So I am in search of the color that will promote words...lots and lots of words...and help me get them on paper. Pictures will soon be coming so you can see how simply adorable my new office is. I must go. I feel some words bubbling up! Blessings. I spent the morning writing on the study of Elijah. Seriously moms, this is a great study. I have really enjoyed studying out the slice of life recorded in the Scripture of this man. After his great victory with the prophets of Baal, Elijah's life was threatened by Jezebel. Fear replaced faith and he ran, landing in a cave. Alone in the darkness he despaired of life. He suffered a major meltdown, what we would call burnout, right after a stunning victory. Now no one has tried to kill me for my faith, so I don't want to judge the prophet too harshly, but I have spent a few days thinking about the danger of burnout. I am trying to so order my life and my love for Jesus that I am certain not to fizzle out before the finish. I am trying to keep my soul and spirit saturated with Jesus to prevent it. I am trying to maintain strong family relationships to bolster my courage. I am investing in godly friendships to keep my emotional tank full. I am serving the Lord to keep myself accountable and I am pressing on, running with endurance the race set before me. Check yourself, dear bloggy momma. Are you on the track for burnout? 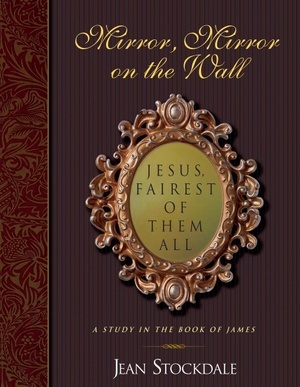 Mirror, Mirror on the Wall is a study on the book of James. James was the half-brother of our Lord, according to the flesh. His perspective on living the Christian life is especially meaningful to me, having grown up in the same household as the Lord Jesus. It is noteworthy that James did not come to saving faith until after the Resurrection. From his conversion on, he was in invincible prayer warrior, a dedicated church leader, and ultimately a martyr for the cause of Christ. The little book of James is packed with nuggets of truth to guide our Christian behavior. This study deals with the issues of suffering, the progression of sin, anger, the issue of our words, the doctrine of faith, good works and the meaning of true religion. This Bible study will help you take the profound truth of the Word of God and make it practical for daily living. This study is also written to be done by an individual or a group with the accompanying DVDs. All of the studies have daily homework that will help you dig out the pearls of God's wisdom and apply them to your life. I deliberately use many personal illustrations and my own life message to make applications that will help you develop personal holiness and practical righteousness. I believe the study of the book of James would greatly enhance your walk with the Lord as well as sharpen your Christian mothering skills. A leader's guide is included in all of the studies. If you would like to receive any of these materials please contact me at jean@standingnearthecross.com or call 1-877-409-5564. God bless. 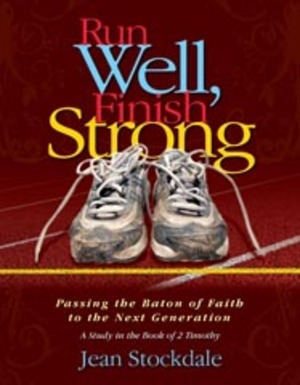 My second study is on the book of 2 Timothy entitled, Run Well, Finish Strong. The book of 2 Timothy is Paul's final book before he was martyred for the faith. Paul finished his course, ran his race and kept the faith. In this letter, he was essentially passing the baton to his true child in the faith, Timothy. His poignant words to run well the race God has given him are deeply meaningful to Christan moms who desire to see their children come to faith and walk with the Lord. This study is designed to give moms practical ways to hand down a living faith in the Lord Jesus Christ to their children. Sanctified humor and healthy doses of practical illustrations are incorporated with Biblical truth in this study. It is designed to be done by an individual, in a small accountability group or in a church setting with the accompanying DVDs. Any mom who desires to pass her faith along to the next generation would benefit from this study! Should you have any questions or wish to order these materials please email me at jean@standingnearthecross.com or call toll free at 1-877-409-5564. Most of you know that I have been teaching moms for the last 18 years. For over 8 years I have been writing my own Bible studies for the moms to use. Last year I started self-publishing my studies along with accompanying CDs and DVDs. I am currently selling them off the blog and will soon have them available off my website as well. The studies can be done alone by an individual, in small groups or incorporated into Women's Ministry in a church. The DVDs make a 10 week Bible study. The first study is on the book of Proverbs. It tackles issues such as anger, words, friends, work ethic and other pertinent topics that apply to mothering. 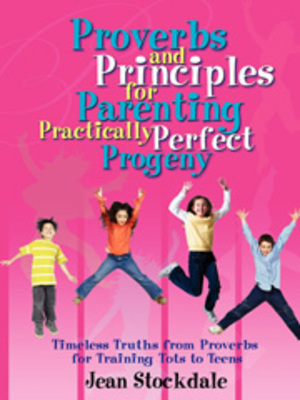 It is full of practical tips, personal illustrations and Biblical principles for raising tots to teens. Should you be interested in obtaining any of these materials, please email me at jean@standingnearthecross.com or call 1-877-409-5564 and I will be happy to help you. Last night I went to kick-off the Disciple Life Moms' Ministry at Bellevue. We have over 20 moms that are doing the Moms Ministry via DVDs. They are studying "Mirror, Mirror" which is the study of the book of James. Now seriously folks, this really floors me that women would come and watch Bible study on DVDs. How in the world God can use my messages played out on the flickering images of a TV is beyond me. The fact that they come, blesses me beyond what I can say. If they come back a second time, well...I will be astounded! God uses the ordinary things of this world for His kingdom work and it does confound the wise! I have just published my 3rd Bible study and the study on Elijah will be out in the Spring. God is beginning to enlarge the borders of this ministry beyond what I could imagine. We have 11 churches that are using the materials and the DVDs. We are so grateful for what the Lord is doing to reach sweet little mommas to encourage them through the Holy Spirit of God and instruct them through the Word of God. Blessings. Those of you who joined us yesterday at Bellevue for the message on irregular people, certainly proved yourselves not to be ones! It was so good to see so many of my sweet friends. I have missed teaching since it has been a couple of months since I have gotten to belt it out, and frankly, it felt good! Thanks for all the prayers and encouraging words. Today I am back in writing mode. I am still working on Elijah. I will be starting the next study within a week or so. I am considering another OT study since I really do love the OT and feel so many of us are unfamiliar with much of it, having resided in the NT for most of our Bible study. I will keep you posted. Blessings to all.